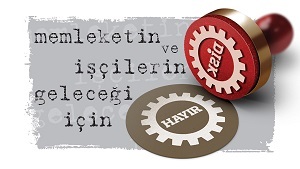 Confederation of Progressive Trade UNIONs founded in Istanbul on February 13, 1967. DISK was founded by Kemal Türkler, Riza Kuas, Ibrahim Güzelce, Kemal Nebioglu and Mehmet Alpdündar representing Türkiye Maden-Is, Lastik-Is, Basin-Is, Türkiye Gida-Is and Türk Maden-Is, respectively. All of these UNIONs were until that time affiliated to Türk-Is, except Gida-Is which was independent. DISK was born at a time when relatively broader rights and freedoms had been recognized by the Constitution of 1961, the trade UNION acts of 1964 accepted the right of the workers to collective bargaining and strike, and revolutionary movements gained momentum on the politic arena. The first general assembly meeting of DISK took place in Istanbul on 15.6.1967. Some of the resolutions adopted at the congress were: support to the campaing R22;War Against Hunger” launched by the student organizations, establishing a solidarity fund with the assistance of larger UNIONs to help the weaker ones, research on occupational diseases and accidents, and converting the DISK newspaper into a weekly that would be distributed free of charge. The board elected at the meeting consisted of: Kemal Türkler (chairman), Ibrahim Güzelce (general secretary), Sinasi Kaya (vice-chairman), Mehmet Alpdündar, Riza Kuas, Kemal Nebioglu, Kemal Ayav, Necati Akbay, Avni Erakalin, Binali Ökce, Ehliman Tuncer, Nusret Önsüer and Nurettin Tezel. The problems of the working class can be solved in a totally independent, social-minded order, which necessitates a planned statism. Heavy industry, mining, banking, insurance and large-scale transportation and foreign trade can only develop if they are controlled by the state. A rapid industrialization under state control is the only way of attaining and maintaining higher living standards for working people. The evaluation of national and international events from a working class and scientific point of view is necessary for enhancing the revolutionary level and awareness of workers. A radical land reform is required for bettering the conditions of peasants and providing a basis and support for the industry, as well as reducing unemployment. Professional struggle is not sufficient for attaining the full rights of workers. It must be complemented by political struggle, utilizing all of the democratic rights enumerated in the Constitution.